We are an experienced law firm, with over 35 years of experience and proven results in civil litigation and criminal defense. John D. Robertson has extensive experience in federal courts, both locally and across the country, as well as in California state courts, and was formerly an Assistant United States Attorney for the Central District of California (federal prosecutor) as well as a City Attorney for the city of Los Angeles. Testimonials from satisfied clients, as well as judicial comments, reflect the excellence of our work and service to our clients. You need an honest, accessible, experienced, and caring lawyer, who is also a tenacious and committed advocate for your side, and who takes pride in his work, his accomplishments, and, most importantly, your success; not an attorney whose only aim is to get your money by giving you false promises. We don't make empty promises; we get results. 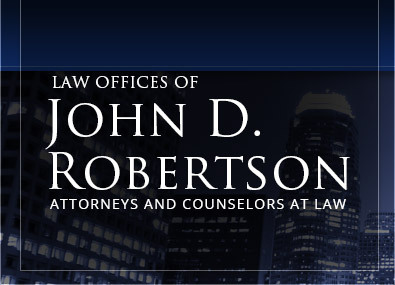 John D. Robertson has been a practicing attorney for over 35 years, with a proven track record. His honesty, integrity and success are established by a sampling of just some of the many testimonials from satisfied clients. He has served as a mentor and teacher to other lawyers and even candidates for the California lawyer exam. Mr. Robertson is a top graduate, literally, of the best schools in the country, and has a unique perspective and advantage, as a former federal prosecutor, in successfully defending criminal accusations, having been on "both sides of the table." Unquestionably, and perhaps most importantly, this distinguishes Mr. Robertson and his firm apart from the vast majority of other lawyers. So please contact us at any time, 24 hours a day, seven days a week, and we will be happy to discuss your matter and honestly inform you of how we can help you and be successful in handling your matter.